Anyone following my blog knows that I am big believer in the magnificence and power of gratitude. I try not to end a day without finding something (if it’s not been a stellar day…) or an abundance of things to be grateful about. And expressing that gratitude never fails to make me feel good. However, as we start 2016, I have upped the ante to adding on Finding, Feeling and Discovering Joy as the bench mark of my day. I must be honest. It’s easier on some days than others. But those are the days when I dig in deep and look carefully at what the day has brought me. My team has also jumped into this game with total commitment and start the day challenging each other to put as many notes into the jar as possible. Yes, more than 1 note a day is not only allowed but encouraged! Joy does not have to be a bold and brash event for me to recognize it. I grab any moment that takes me to a place of celebration. The Joy Jar is my motivation to actively look for and pause for these subtle and quiet and sometimes earth shattering occurrences and ‘aha’ moments. Joy makes me feel alive; it makes me a better person and makes me believe that I can do anything. 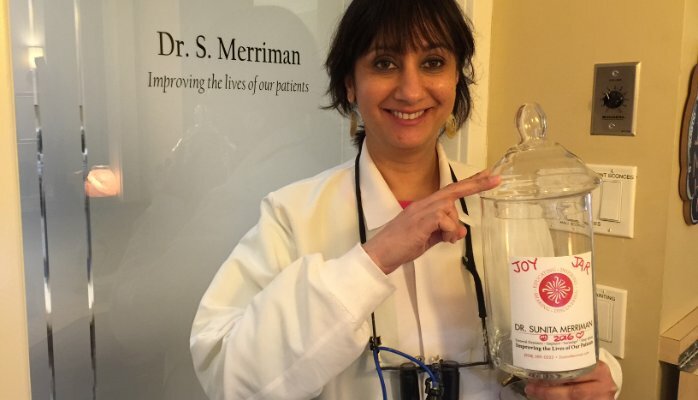 That is how Joy helps our patients get the best possible care at our practice.